do you ever stop and think about what that means? specifically, it is anything that provides mental stimulus for thinking. but how often do we actually choose our food in an effort to boost our brain activity? well, for me, rarely. if i’m actually thinking about my body in any way related to what food i’m going to eat, it’d be my waistline – not my brain. as an intense food lover, i’m prone to eating rich, delicious protein (see my cleveland part 1 blog for proof), cheese of all kinds, pasta, pizza, fried foods, burgers (i’m getting hungry) – you get the gist. that being said, i also like fashion, and if i chose to eat those kinds of food at every meal, a lot of my cuter outfits would never see the light of day. so i typically try to eat healthy at home. i figure if i can’t control the enormous amount of butter and salt that’s in restaurant dishes (i used to work in one, so i know), i can control it at home. i almost always add a healthy twist to my recipes (okay, i went all out on this one, but that’s more for special occasions). i get my recipes from a variety of places – food magazines, cooking shows, the internet – and more often than not, i’ll tweak them. if it calls for pasta, i’ll use zucchini noodles. if it calls for butter, i’ll use smart balance. if it calls for ground beef, i’ll use turkey or chicken. if it calls for cheese – well, i usually don’t skimp on cheese, but you get the idea. i’m also a big fan of using what’s about to go bad. i hate when some poor bit of produce is about to wither away because i didn’t have a plan for where to put it. 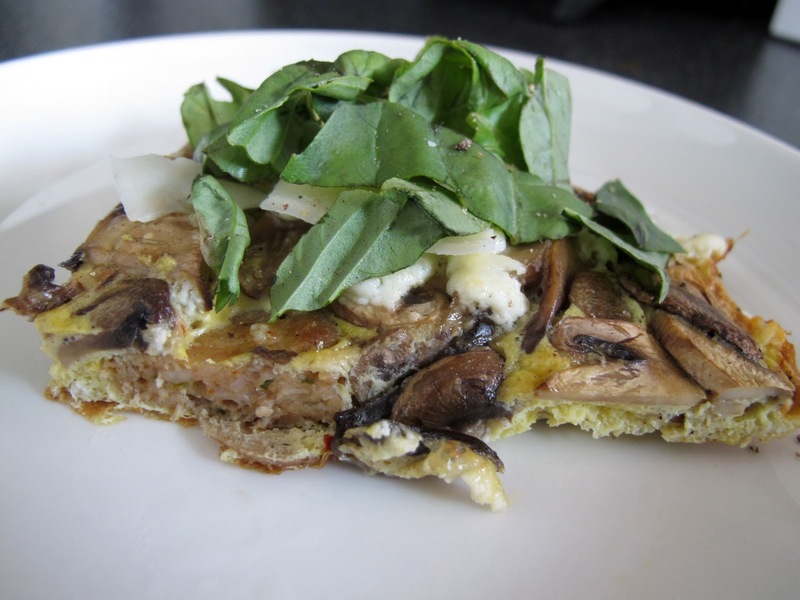 and that’s where my weekly go-to frittata fix comes into play. i usually make it on saturday or sunday morning, and it’s perfect for brunch. i make a little extra so we can have the leftovers one night for dinner with a salad & a glass of rosé. the recipe below is for a 10″ nonstick skillet. i cut it into fairly large pieces, like a large pizza slice, but you could do smaller & serve with fruit & english muffin for brunch. i use whatever produce is about to go bad – i’m going to sauté it, so if it’s a little wilted it will still be okay (mushrooms, bell peppers, asparagus, broccoli, onions, zucchini, tomatoes & squash are all good) combined with a little protein, a complementary cheese, & fresh herbs. here is the one i made this past weekend. sauté the mushrooms in a 10″ nonstick, oven-safe skillet. i season separately to achieve maximum flavor, so add a dash of kosher salt and a few twists of pepper once the mushrooms have started to brown. while the mushrooms are cooking, slice the sausage into ¼” discs. remove the mushrooms from the pan and add the sausage, browning both sides. while the sausage is cooking, beat your eggs and egg whites with the following seasonings: herbs de provence, crushed red pepper and a little salt & black pepper. place the mushrooms and sausage on a plate lined with a paper towel to absorb the grease from the sausage and water from the mushrooms. wipe any remaining grease from the pan and add a tbsp. of butter or margarine in the pan over medium heat. turn the broiler to high. add the eggs and sprinkle in the mushrooms and sausage. using a spatula, lift up the edges of the egg to allow more of the mixture to be heated through. add in dollops of goat cheese, and once the eggs are set on the bottom (i.e., they don’t jiggle) the frittata is ready to finish cooking in the oven. place the oven-safe skillet on the upper rack about 12″ away from the broiler for just a couple of minutes to allow the eggs to cook through and the cheese to brown. remove from the stove and sprinkle with fresh basil. divide into slices and serve immediately. enjoy!